Above, the 6V 1W PV array. 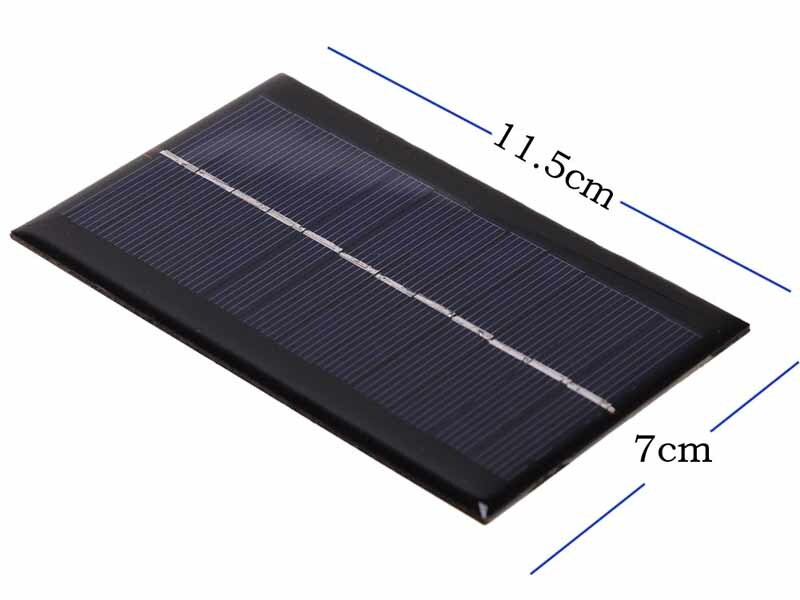 6V 1W PV array, 1N5819 diode, TL431 reference, BD140 transistor, 6k8,10k,470R 1% resistors, 1200mAh 1S LiPo battery. Total cost of electronic parts is less than A$2. The PV array and the battery are each about A$3. Maximum current to be sunk in the regulator is 6V/1W=0.17A, 0.17*4.3=0.73W dissipation essentially all lost in the BD140 transistor. Rthja for the BD140 is 100°/W, so for Ta=50°, Tj would be 50+0.73*100=123°, well within the rated maximum of 150°. 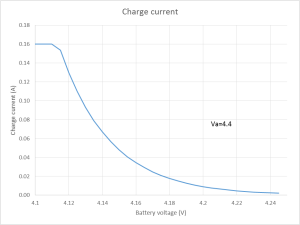 If the charger makes 4 hours in day at 0.17A, that is 0.68Ah, two days is sufficient to fully charge the 1200mAh battery so the charger could be shared amonst many Foxflasher2s. Alternatively, a dedicated 100mW PV array may suffice as 10 charging days in a month would keep the battery charged in use. If you wanted to use a larger PV array, the BD140 is good to 1.5A but will need an effective heatsink. Above is the charger schematic. 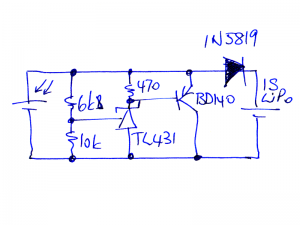 Substituting a 20k trimpot for the 6k8 and 10k resistors allows fine adjustment of the charger voltage. 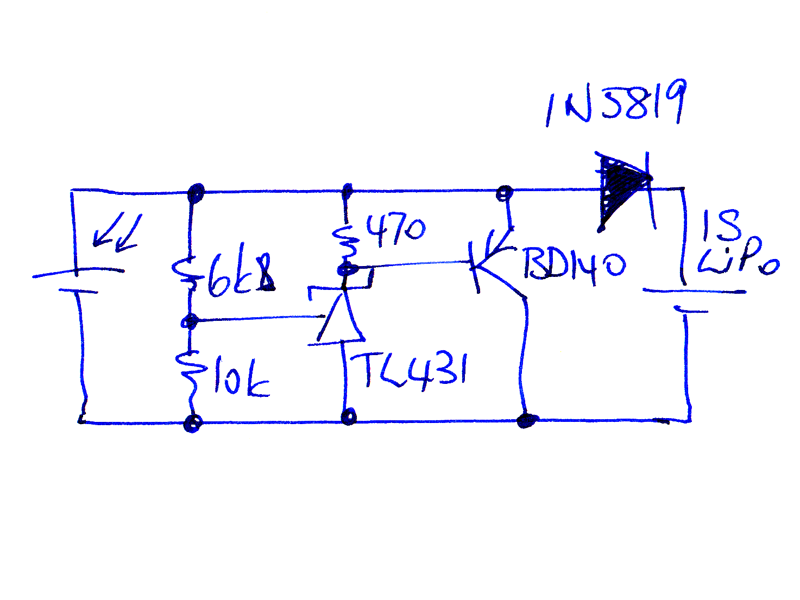 The voltage drop across the 1N5819 depends on current, about 400mV at 200mA, so adjusting the anode side voltage to 4.4V should result in good charge rate up to battery voltage of 4.0V, and charge tapering off to mA by 4.2V. 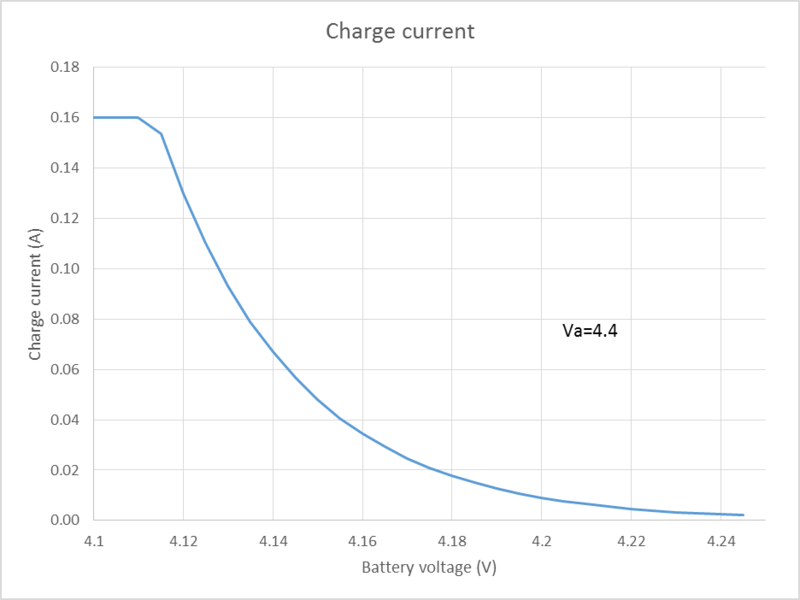 Above is the effect of the diode in tapering charge current. The curve is constructed from an approximation of the diode characteristic using SPICE parameters plugged into the modified Shockley diode equation. Va is the diode anode voltage (wrt batt -ve). The model does not include circuit or battery resistance, so actual current will be a little lower and quite dependent on the battery. The saturation at 160mA is due to the solar panel used, Isc=160mA. 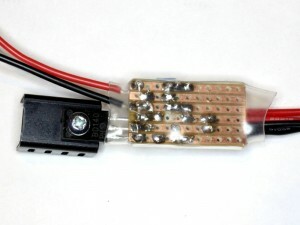 Resistance of the connections matters, keep the voltage sensing connections free of load current. 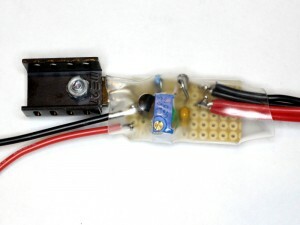 Above, the prototype shunt regulator. PV array to the left and battery / load on the right. Temperature rise was measured at 50° at 0.5A, 4.4V. Above, the underside of the prototype regulator.